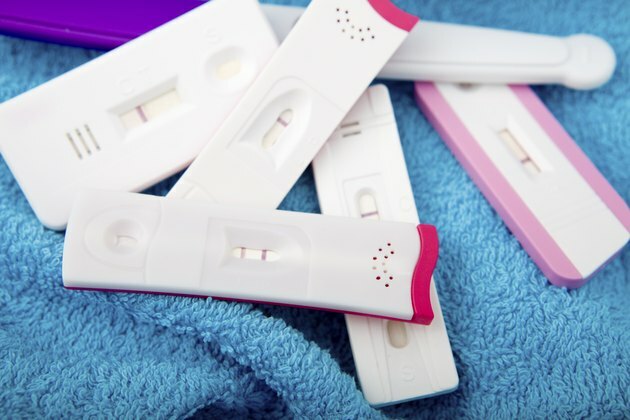 Whether a woman has missed her menstrual period or simply "feels pregnant," home pregnancy tests offer the convenience of testing without having to make a doctor appointment. Home tests sense the hormone hCG, which is produced by the chorion (part of what will become the placenta) of a developing embryo. For this reason, in theory, the test should be foolproof—a woman can't produce hCG unless she's pregnant, and if she's pregnant, she must produce hCG. There are a few drugs, however, that can affect the results of a home pregnancy test, and all are fertility drugs containing hCG, according to the United States Department of Health and Human Services. The drug Profasi is used to stimulate conception in women, by acting as an analogue of the hormone LH, according to Drugs.com. It is generally administered by a medical professional as an injection, either subcutaneously or intramuscularly. It has other uses as well—in men, it stimulates the production of testosterone and increases sperm production, while in male children it is sometimes used to treat cryptorchidism, a condition in which the testicles fail to descend. Pregnyl is isolated from the urine of human women, and is then purified and administered as a pharmaceutical injection. The Internet site RXList notes that this drug, like many hCG-containing pharmaceuticals, also has some application in men. The reason for this is that Pregnyl acts very similarly to a hormone produced by the male anterior pituitary gland, which is located in the brain. RXList also notes that Pregnyl can cause side effects very similar to the side effects of pregnancy—fatigue, headache, depression, and breast development are common in both genders. The pharmaceutical marketed under the name Pergonal is a mixture of lutenizing hormone, also called LH, and follicle stimulating hormone, or FSH, notes the Drugs website. Like hCG-containing pharmaceuticals, it is used to stimulate ovulation in women and testosterone and sperm production in men. Interestingly enough, Pergonal demonstrates the opposite side of the similarity in the actions of LH and hCG—while hCG can stimulate ovulation (an action normally initiated by LH), LH can cause a pregnancy test to record a false positive (normally associated with hCG). The similarity between these hormones leads to another interesting coincidence—ovulation prediction tests (which test for the hormone LH) can be used as pregnancy tests in a pinch. Though they're meant to check for LH, they'll also respond to hCG because of the similarity between the hormones.